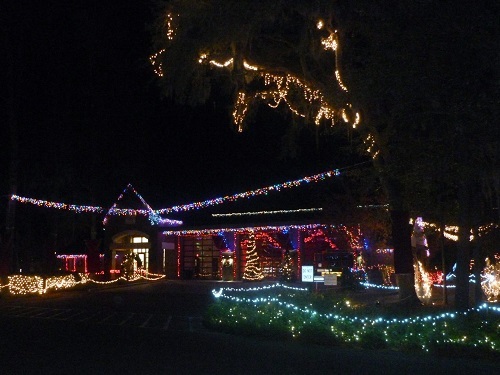 Both Bluewater Resort and Marina and Waterside Resort offer a brand new festive Holiday Light Tour for you to experience a variety of Christmas light displays all around Hilton Head Island! Gather at your Resort’s Activities meeting place for hot cocoa and delicious cookies. Your tour guide will explain the unique qualities of the individual stops along the way. This is the time to let them know if you have any special requests during the tour. You can also ask any questions along the way! 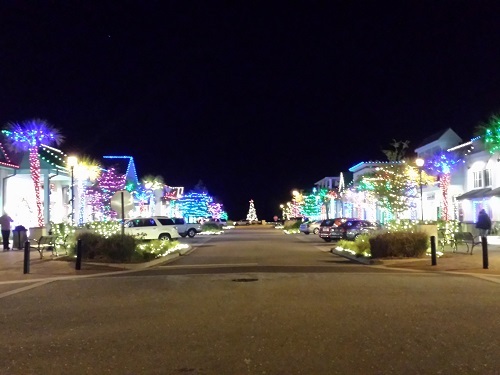 The Holiday Light Tour drops you off at the Shelter Cove Community Park and gives you 30 minutes to explore the Towne Centre. Walk down the main road to visit a mixture of local and popular stores. Enjoy unique decorations that each store has put up to celebrate the Holiday Season. My favorite place to stop is Kilwins for a delicious cup of Holiday hot cocoa. With the cocoa warming you up, you could take one last spin around the beautiful Christmas tree that sits in the center of the park. The tour van will drop you off at Harbour Town Marina for a fun-filled walk to the Harbour Town Lighthouse! 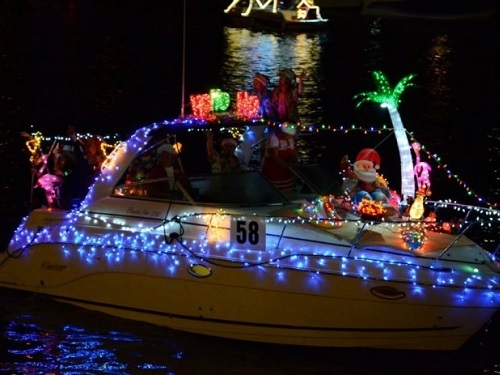 On the walking path, you will have the chance to pass the beautiful yachts decorated for Christmas! 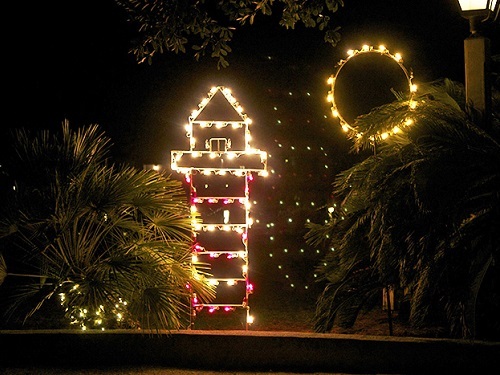 The owners take great pride in decorating their boats each Holiday Season to show off their unique light decorations. You will also pass the shops that have decorated their store windows and the walking path. My favorite sight is the Lighthouse. The structure is calming and exciting all at once. Take photos, to capture the memories. There is also a gorgeous Christmas Trees for fun family photos! 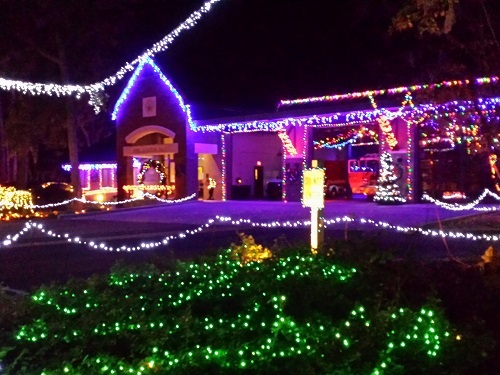 The Hilton Head Firefighters Christmas Lights are back at Fire Rescue Station 3 (534 William Hilton Parkway)! The tour van will drive around the fire station to show you the awesome display created by the Hilton Head Firefighters! Every corner of the station has a different unique display. Keep an eye out for Santa Claus! Don’t forget to sign up for the tour to reserve you and your family member’s spots as soon as possible! 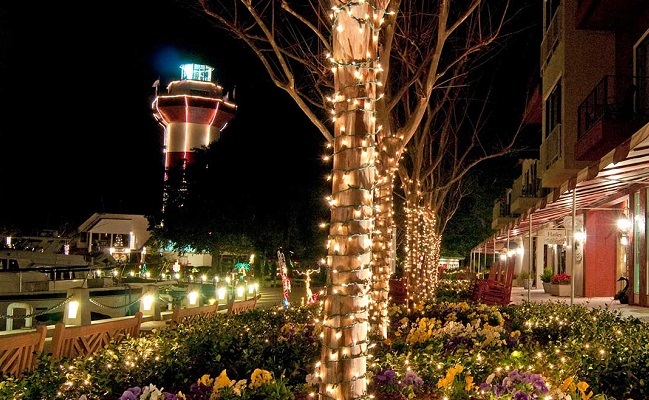 We hope you have an exciting time on the Holiday Light Tour around Hilton Head Island. We wish you and your family have a very Merry Christmas and Happy Holidays! Share your photos and experience with us on Social Media.